As you can tell by the title of this post, it was a week of firsts! This week B and I picked up our first CSA pickup. I’m excited that we finally signed up for the small share of Fresh Fork and the pick up is just down the street from where we live. It really is perfect! The first week included some strawberries, red kale, broccoli, black turtle beans, lettuce, eggs and a whole 5+ lb chicken. That’s right, I got a 5+ lb organic pasture-raised chicken to use! We have of course been eating the lettuce for salads, eggs for breakfast, strawberries for snacking and I immediately made the beans to enjoy as part of nearly every meal. The chicken? I had to call / email my mom for her thought – and she suggested I roast it. 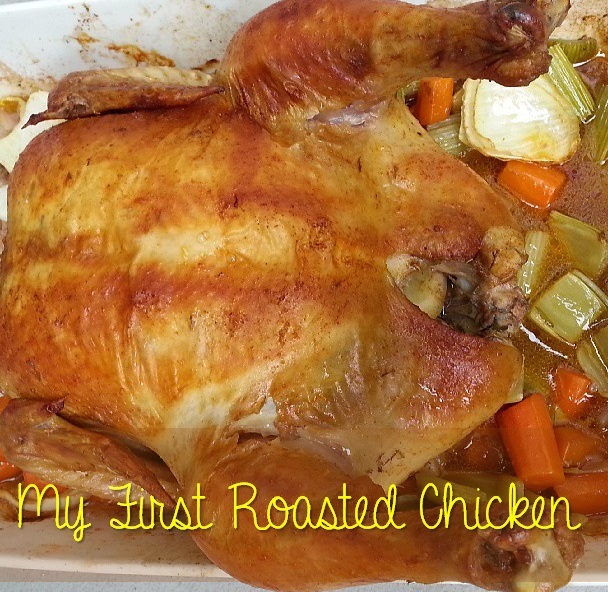 I figured she was right – she IS my mom, and roasting a chicken is one of the easiest things you can do – plus I’d never done it before! How did it go? It ended up tasting delicious and we’re halfway through the leftovers. But it wasn’t as easy as it looked. Sure, seasoning it and cooking it? A piece of cake. But cleaning it out? Finding the so-called giblets (pronounced with a soft G, not like I was saying – glib-lets)? I still have no idea if I found them. I had to call my mom and ask her what they looked like and how to take them out. I even took a picture of the inside of the chicken just to share with her so she could tell me where I may find them and how to get them out. Here’s how our conversation kinda went. Me: I just sent you a picture. Me: No, I can’t find the gliblets. Mom: Giblets? They’re in a bag. Me: No, this chicken doesn’t have a bag inside it. It’s a REAL chicken. No bags. It’s natural. Mom: Oh I just got the picture. Eeew! That’s gross. I’m deleting it. Me: No! Wait! Where are they? Mom: I see them! See that white thing? Just down the back past them! Me: Where? I don’t see them! Mom: Eew, clean it out better, some parts are still red. Me: Again? I just want to find the giblets! Me: They should have them come painted green or something so you know to take them out. And can find them. Mom: Then it’s not natural if it’s painted? That’s pretty much it. Word for word. I know now you’re probably wondering what recipe I used to roast the chicken, right? Because your mouth is watering after hearing that whole conversation? Well, here you go. It’s below. It’s a combination of my mom and Ina Garten’s recipe – and it’s delicious! Remove the chicken’s neck and giblets. I’m told that if you buy a roasting chicken at the store it will come in a baggy or something … if not, call your mom for help. Thoroughly rinse the chicken inside and out. Pat the outside VERY dry. Liberally add salt and pepper and 2 tbs (approx) of thyme the inside of the chicken. Stuff the chicken with the garlic and lemon quarters. Brush the outside of the chicken with the butter and the paprika paste. Sprinkle again with salt, pepper, garlic powder, parsley and remaining 2 tbs (approx) of thyme. This is where Ina and my mom suggest that you tie the legs together with kitchen string and tuck the wing tips under the body of the chicken. I didn’t have kitchen string and since I’ve seen Bridget Jones Diary I know better than to use any old string. So I didn’t — and it turned out alright! Place the onions, carrots, and celery in a roasting pan. Pour chicken broth over vegetables. Spread around the bottom of the roasting pan and place the chicken on top. Put it back/but side down and belly side up! Roast the chicken for 1 1/2 hours, or until the juices run clear when you cut between a leg and thigh, or the thickest part of the leg/thigh is 160ish degrees with a meat thermometer. Remove the chicken and vegetables to a platter and cover with aluminum foil for about 20 minutes. Slice the chicken and serve it with the vegetables. Funny post. I had to watch a youtube video to see how to cut one up. I watched YouTube and searched images to find the silly giblets. Still don’t know what happened to them!